Andy Murray finally ended Britain's 77-year wait for a men's singles champion. (Getty Images). Since Fred Perry defeated the German Gottfried von Cramm in a one-sided 6-1 6-1 6-0 final to claim his third successive men’s Wimbledon singles title 77 years ago, Britain has pinned its hopes on a procession of native challengers, each of whom have come and gone without success. Andy Murray finally ended that interminable wait by beating Novak Djokovic on Sunday, but the wait has been so long there has been talk of curses and jinxes. But was there ever really a curse? In truth, in the seven decades since Fred Perry’s three-peat as Wimbledon champion, Britain has never produced a legitimate Wimbledon contender - with the exception of 1939 runner-up Bunny Austin. Roger Taylor made a few semifinal appearances back in the 1960s and 70s, but in the era of Rod Laver and John Newcombe his chances of going any further were slim to none. His one real opportunity was in 1973, when the vast majority of top players boycotted the event allowing unknown Jan Kodes to break through and take the title after narrowly beating Taylor in the semis. Throughout the 70s, 80s and early 90s, top British prospects Mark Cox, John Lloyd, Buster Mottram and Jeremy Bates between them never made it passed the fourth round. But these players weren’t cursed, they simply weren’t good enough. Hope of a British champion was rekindled when Greg Rusedski elected to represent Britain over his native Canada in 1995, but his lone run to the quarterfinals in 1997 was an outlier in a Wimbledon career that was better defined by disappointing early round exits. Clean-cut, polite and unassuming, Henman exemplified the British aesthetic to a tee. However, his game, while without any obvious weaknesses, lacked a grand slam caliber weapon. Compared to Pete Sampras’ serve, Andre Agassi’s forehand, and Patrick Rafter’s volleys, Tim Henman’s smooth and steady game did not resemble that of a Wimbledon champion. And yet, from 1996 to 2004 Henman made four semifinal and four quarterfinal appearances, often falling to one of the giants of the game. His best opportunity came in 2001, when he seemed set to make his first final only to lose out to a revived and inspired Goran Ivanisevic who seemed to have destiny - and Mother Nature, in the form of very timely rain delays - on his side. Henman’s consistent runs into the second week re-energized the British public’s interest in Wimbledon. Fans packed the All England Club’s grounds to find a patch of grass on Aorangi Terrace to watch his matches on the big screen. The lawn would go on to be known colloquially as "Henman Hill." The British media treated Henman like a choker but it is arguable he was an over-achiever, out-matched by legends of the game. If anything, Henman was blessed, rather than cursed. Equally, Britain has been far from cursed in the other Wimbledon events. Virginia Wade captured the ladies’ singles title in 1977, just 26 years ago. Last year Jonathan Marray claimed the men’s doubles titles, and even Andy Murray’s own brother Jamie has a Wimbledon title, having won the mixed doubles back in 2007. Simply put: there never was a curse. In fact, if there was any supernatural intervention, it was destiny. In his seventh grand slam final; on the seventh day of the seventh month; facing an opponent seven days younger than him; Andy Murray attempted to claim a title first contested in 1877, becoming the first Brit to do so in 77 years, and the first to win either single championship since Virginia Wade back in 1977. Of course, Novak Djokovic was also looking to claim his seventh grand slam title. Just a few weeks later, he was afforded an opportunity few athletes are ever given; a second chance at Wimbledon - this time to claim Olympic gold. Facing the same foe, on the same court, Murray overcame his demons and captured a title that seemed for all intents and purposes to be everything he had missed out on in that ill-fated Wimbledon final. But it wasn’t a slam. That milestone would have to wait until later that summer, when the Scot defeated Djokovic in five sets to become the U.S. Open champion. When he returned to the All England Club in 2013, he was now an Olympic gold medalist, a grand slam champion and a national treasure. Under the pupilage of the stoic Ivan Lendl, Murray also had a newfound focus on court, less prone to the outbursts that had once plagued his career and notably steadier under the brightest of spotlights. The final game on Sunday was a microcosm of the match as a whole. 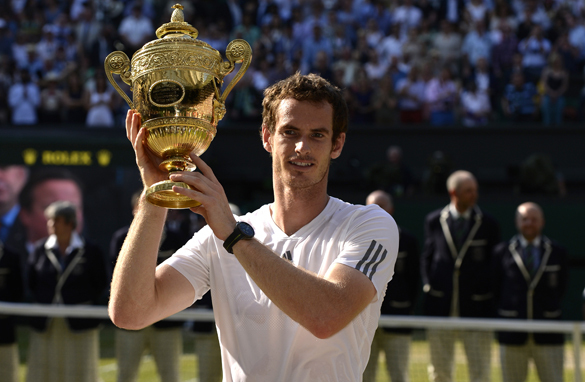 Serving at 40-love, with three championship points on his racket, Murray looked a lock to become Wimbledon champion. But Djokovic rallied, tied it up and moved ahead, proving once again that getting to match point and beating the Serb are two totally different tasks. The final few points saw dead netcords, incredible angled passing shots and unimaginable return-winners as Djokovic threw everything at Murray for 11 minutes and 47 seconds. It was pure unadulterated torture for the 15,000 inside Centre Court, the countless thousands on Henman Hill and the millions all over Britain. “Imagine playing it,” Murray quipped when asked about the agony of watching of the final game. Even the poker-faced Lendl couldn’t resist a rare micro-smile, as his lips quivered, suggesting that emotion was being shielded behind his ever-present sunglasses. Murray said after the match that he doesn’t remember what happened in the last game. You can be assured that if he comes within eyeshot of a television during Wimbledon for the rest of his life, he’ll soon have every shot memorized. The real question is, now that everyone in Britain knows that he can win Wimbledon, will he be expected to do it every year, and what happens if he can’t? After all, Fred Perry won three in a row. I assume from the last sentence the writer s British. If not, he's doing a good impression of a Brit. Who else, on the day after one of his country's finest hours would dampen the spirits by suggesting Murray has not yet done enough. Fred Perry won 3 in a row in a different era when there were fewer players and less to the sport than there is now because of the physicality of today's game. Comparisons are therefore ridiculous. Murray's achievement was massive, Brits should savor it, hope to repeat it, but not demean the victory with a sneering "Well you've only one it once!" type comment. On second thoughts,perhaps the writer is an American after all, as they are peeved Murray won as now as their Wimbledon men's singles drought is put into sharper focus with no-one on the horizon to end it in a hurry. Great article Will, I enjoyed it. Your writing style is top-notch. BRAVO, Where does Andy Murray come from in Scotland? Well let's not get ahead of ourselves with just one win and remember he is not young as Federer or Nadal was when they won their first major like this. Their class way above Murray and If someone expect him to win next 2 or 3. I would say it is a wishful thinking that only comes true in fairy tales. Nadal went out in the first game but do not count him out because my feeling he is coming back next year fully fit and would change the course of this tournament. When the dust settles on the Centre Court in Wimbledon, the 2013 Championship will be remembered as the year when Andy Murray, the saviour of British tennis, finally answered the prayers of millions of British tennis fans to claim the men’s singles title for Great Britain; the first for the “kingdom” in 77 long years. The ghost that has haunted British tennis since the last of Fred Perry's hat-trick of wins in 1936 has finally been laid to rest! It is a new dawn for British tennis and the end of an agonizing wait… their man has reached the “pinnacle of tennis”! The 77 year old wait must have been excruciatingly painful for British fans, media and players alike. Year after year of renewed hope and excitement; only for it to culminate with broken hearts and tearful adieu. The most painful of these was undoubtedly Murray’s loss in the 2012 final. It’s only fitting that, 12 months on, the wait has been ended by the same man who wept his heart out on Centre Court after the heart-wrenching loss to Federer. Incidentally his country of birth, Scotland, has just ended a 117 year wait for a Wimbledon champion. Murray ended the wait with a convincing win against a man who, along with Nadal, will be his biggest rival for the next 5 years, at least. Murray looked sharper, more eager, hungrier, and desperate even, and definitely more focused. Djokovic on the other hand looked a mere shadow of the player who brushed aside worthy opponents in lesser rounds – most notably Del Potro, Berdych and Haas – all with a reputation of being giant killers on this surface. The Serb seemed to have forgotten his Serve in the locker room and could never find it! Right from his first service game, the Djokovic service game was under the gun. It took the 2011 Wimbledon champion a good part of three service games to find his first serve and that too for only a brief period of respite. Murray maintained his focus and composure and kept up the pressure on Djokovic serve. Every ball came back; demanding more and more from Djokovic till he would lose his composure and would either go for too much or would present an opening to Murray. Murray, to his credit, took his chances; stepped up his game at key moments in all three sets; and made Djokovic pay for his inability to find his customary Midas’s touch. Djokovic fought bravely; like a wounded soldier who couldn’t find his weapon of choice. And then there came the decisive moment… Murray broke Djokovic to set up a chance to serve for the match. Three near perfect points and the entire Great Briton was jumping for joy! Their man had three match points to reach the hallowed land! Those in the celebrity box, along with the rest of the stadium, jumped up from their seats… they could literally feel their hands wrapped around the Wimbledon trophy! And then, a great champion smiled… He looked into the sky, peaked over to his small section of supporters and said “not so fast”. Then came the three best points of the match and the match-points evaporated faster than what a plastic surgeon can do to the wrinkles on Judy Murray’s face. The great champion fought on… three break points came, one after the other, but Murray remained defiant; refused to crumble under the pressure of history; maintained his calm and focus when everyone around him was losing theirs. The great champion fought bravely but it was just not meant to be… this was Murray’s destiny… Great Britain’s destiny! A destiny, that announced the beginning of a new dawn in men’s tennis. Sunday’s final signalled the coming to age of a new rivalry in men’s tennis. It proved, beyond a shadow of a doubt, that Andy Murray is here to stay – he is no longer a one slam wonder! A rivalry that has long been threatening to break out from the shadows of the brutal battles of Nadal vs Djokovic (and of course, the timeless Federer vs Nadal classics) has finally reached its pinnacle. It’s the era of Djokovic vs Murray now, at least till the start of the next clay court season. Separated in age by a just a week, these two giants are sure to give tennis fans the world over countless such epics in the near future. Let’s look forward to the US Open! One thing is for sure – when the dust settles, a great champion will once again emerge! Great article for someone who enjoyed the coverage on the major networks but not an avid tennis fan. Enjoyed learning more of the history of the match as it relates to the winner. What an accomplishment for the Brits!! !